Valentine’s Day – the time of year where the “haves”, “have-nots”, and “don’t-cares” bicker about how or if to celebrate romantic love. To say that Valentine’s Day is a recognized holiday for all is to step onto something akin to a battlefield (an irony that harkens back to the dark history of St. Valentine). To address this issue we should look at some statistics. Approximately 44% of adults in the United States are single and of course the majority of college students are not in a committed relationship. Data from a survey at the Counseling Center at Pace University indicates only 30% of respondents are in a relationship. With so many without a traditional partner, is Valentine’s Day irrelevant for the majority of us? Well one could argue that point however that leaves a lot of messy feelings and no place to put them. So, for those who care about Valentine’s Day, it makes sense that we re-vision the holiday as a holiday for love of all kinds, not just one kind. This allows us to spend time with anyone of our choosing. For this holiday, get together with friends, family, partners, or your pet and celebrate in some meaningful way. Have a party, go to dinner, see a movie, or treat yourself to something special. 2016 Is Testing Us. Here’s How to Get An A. For most, this has been a challenging year. The past 12 months have been in our face, a barrage of tweets, blogs, sensational headlines, and viral videos. Violence seems everywhere: racial profiling, terrorist attacks, the murder of policemen, peaceful protests met with aggression, and hate crimes on the rise. Vitriolic partisan stalemates and election stress have only made things worse. And if that isn’t enough, this year has had 15 large-scale disasters and another record-breaking global temperature high. All of this can leave us feeling stressed, traumatized, anxious, or depressed. As the year winds down, it is very tempting to see 2016 as unusual, as a bad year. It is appealing to try and forget it, put it behind us, and move on. My advice is, don’t. These events are unfortunately not an aberration; it is likely that more of these events and issues will come. So rather than stick our head in the sand, it is far more effective—and healthy—to be curious about the issues, learn about what disturbs you about them, and then act accordingly. How? Take these three steps. Second, don’t just do something; sit there. So much is said by so many and yet no one is being heard. It is this absence of meaningful dialogue that contributes to many of the problems we face today. So, don’t just do something, sit there—listen and learn about the issue. Once someone feels heard, it is more likely that they will listen, too. Third, don’t give up; the secret to overcoming is persistence. If you don’t like a situation, work to make it better. Change can take time so be patient. Start by choosing a cause you believe in and mobilize: Sign a petition, join a protest or town meeting, volunteer, engage in a dialogue, or donate to a cause. Connect with others to gain momentum and make it social. The act of doing something can lead to feeling better. While this may sound like a primer for political action, it is not. Striking the right tone, listening, and persistent action are the keys to good communication and mental health. Decades of research in clinical science has shown that this approach is the key to overcoming stress, trauma, and suffering. It is the way to move forward and grow healthier. It is what we in the mental health world call post-traumatic growth. Stuffing feelings lead to body symptoms like headaches, stomachaches, and lower back pain. Working through your feelings leads to a more positive, healthy life. So before you wave goodbye to 2016, take the right attitude, listen, and empower yourself to act—and have a happy and healthy new year. In the NY Times article "Teenagers, Medication, and Suicide" Richard Friedman discusses the importance of antidepressant medication use for the treatment of depression and suicide. He provides a fair amount of data to support the use of medication to treat depression. He suggests that an appeal of the black box label (a warning that indicates sometimes this medication may cause suicidal ideation) on antidepressant medication will further increase medication use. Given the low incidence of suicide from the medication use, it makes sense to suggest such an approach. However, it is even more important to inform the reader that medication with psychotherapy is more effective than medication alone and it has the added advantage of weekly monitoring of medication user so that suicidal ideation can be addressed. Are you single? Looking for a partner? Take the time to read Dr. Eugenio Duarte's article on "How Rules Can Ruin Your Love Life". Not only does he address the futility of following dating guidelines but he also helps us glimpse into the process of psychotherapy and how it can help find a happy and healthy relationship. Confused about the difference between prescription drug misuse and abuse? Want to know the warning signs of prescription drug abuse? The National Council on Patient Information and Education has a website on prescription drugs. There are resources for teens, colleges, and parents. Check it out. Just back from a tour of Facebook and a discussion with Emily Vacher, Head of Global Safety, on the latest tech and procedures for preventing suicide and bullying online. Among other things she shared the new online report form for those concerned with friends who may be at risk. 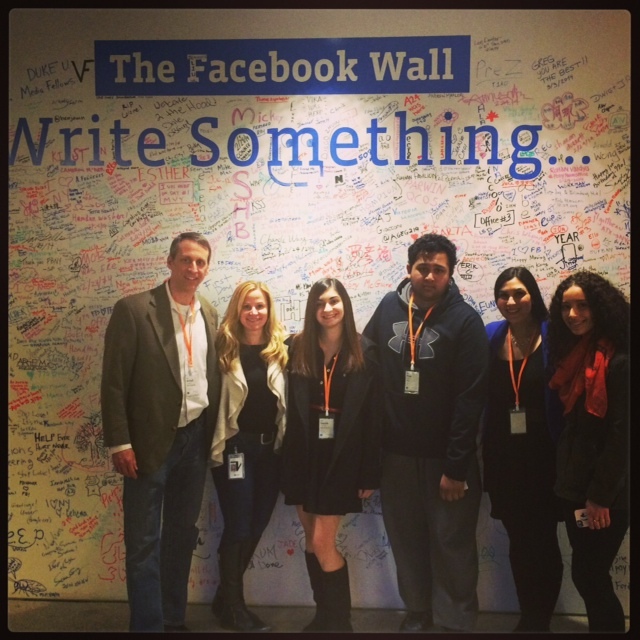 Signing the Facebook wall at the NYC headquarters. On Tuesday April 1st, Pace University is hosting a Town Hall dedicated to the Mental Health and Wellness of college students. The event, taking place at the Schimmel Center, is presented by the Clinton Foundation, the Jed Foundation, and Facebook - and is scheduled to be streamed live! Click below to attend online. You are welcome to attend in person as well (follow this link to do so: https://www.eventbrite.ca/e/mental-health-wellness-on-campus-a-town-hall-without-walls-tickets-11009167717). Join the online discussion with the Clinton Foundation, The Jed Foundation, and Facebook about mental health and wellness on college campuses with:Moderator: Dr. Gail Saltz, Mental Health Contributor to NBC's The Today Show, Dr. Mark Brackett, Director of the Yale Center for Emotional Intelligence, Michael Botticelli, Director of the White House Office on National Drug Control Policy, Misha Kessler, The Jed Foundation's 2013 Student Voice of Mental Health Award recipient, The George Washington University '13, Dr. Richard Shadick, Director, Pace University Counseling Center and Adjunct Professor of Psychology, Starshell, Singer-Songwriter and Young Adult Mental Health Advocate. With a special performance from “The Reality Show: NYU” – an award-winning, compelling program developed to help address the health needs of students. Submit your questions using #myhealthyU. Kenneth Barish Posts "The Most Important 10 Minutes of a Child's Day"
A fellow colleague from the William Alanson White Institute has written a blog worth repeating here "The Most Important 10 Minutes of a Child's Day". I believe it is applicable to all relationships. Members of a very small club? In the New York Times there is a piece entitled "Members of a Very Small Club" written by a woman who lost her mother to suicide when she was very young but did not know anyone else who lost a loved one until she was well into her 30s. She wrote a poignant piece indeed but it was surprising to hear that she has met so few that have been touched by suicide! Based upon the number of suicide deaths in the U.S. in the past 30 years, there are at least 5 million who lost someone dear to them and perhaps triple the number of people who knew someone less intimately. It isn't such a small club. Unfortunately the shame and suffering keeps people from getting the help they need. There are a number of excellent organizations available to suicide survivors; they are just a web search away. This week and next, tens of thousands of college students will be checking into their residence hall rooms, beginning classes, and confronting the difficult task of separating from family and friends. Individuation is not easy and students require support of all kinds. Here is a resource I frequently refer parents to: Transition Year . Each year parents of college students get distracted by the immediate financial issues of tuition, room, and board and forget to protect their investment by talking with their students about all of the challenges their students will face- roommates, new friends, academic pressures, and choices about substance use and sexual practices. Each of these challenges have the potential of derailing their students. Parents, now is the time to have those conversations. This week the NY Times ran an article on female college student casual sexual behavior, often referred to as "hook ups", at an Ivy League university. The author discusses the phenomena when interviewing 60 domestic and international undergraduates from various SES and ethnic backgrounds (but no mention of Lesbian or Bisexual women!). She makes the case that hook ups are so common because these young women have little time for relationships, they are more interested in school and being successful in their future career. While this may partly explain the behavior it leaves out important explications such the fact that this generation is brought up on the expectation that immediate gratification is both possible and desirable and easily delivered by social media and other technology. A lengthy article in the NY Times, "The Suicide Detective" discusses a psychologist's work to try and understand the phenomena of suicide. Dr. Matthew Nock uses the Implicit Association Test (I.A.T.) to ascertain, with some impressive accuracy, who is likely to kill themselves. Excerpted below is his "take-away" message from the I.A.T. research and how he applies it to treatment. He seems to be saying implicitly (pun intended) that Sigmund Freud and Aaron Beck are correct about the suicidal mind. It also suggests that our belief that psychotherapy, particularly the kind that incorporates mindfulness, is the curative agent for individuals who struggle with suicide is correct. In the NY Times article “Suicide Rate Rises Sharply in the US”, there is mention that the suicide rate increase is fueled by the Baby Boomer generation. Some hypotheses about why that is include the bad economy and greater use and access to lethal opioids. However, in this same group during this same period of time there is also a significant drop in psychotherapy utilization and a big increase in medication use during that time period. That seems like more than just a coincidence. Therapy saves lives! More needs to be done to make therapy affordable and accessible to all. It doesn't get much better than this. In the April 14th "Sunday Styles" section of "The New York Times" there is a pithy article "Lessons in Domestic Diplomacy". The author, Bruce Feiler, puts aside his male privilege and openly explores, quoting conflict resolution's and psychology's best, ways to resolve conflict at home. He details 7 specific tips to traverse an argument more effectively. Save yourself some grief and read this article. It could be the most worthwhile 5 minutes you spend all week. What is the key to online dating? In Monday's NY Times, there was an article about the skepticism some psychologists have for online dating algorithms and their ability to make successful romantic matches. "A Match in the Code" discusses what is problematic about assuming that if potential dating partners have similarities in traits (e.g., agreeableness, degree of sexual and romantic passion) they will click. Some of the research psychologists indicate that a lot more goes into compatibility than similarities. As a psychologist who works with couples getting together and splitting up, I agree. As I mentioned in a previous blog ("Preventing Divorce Before Marriage"), expectations play a large role in dating success and marriage. Is a couple looking for a smooth ride or do they understand that a successful relationship takes a lot of hard work, perseverance, patience, and communication skills? As Dr. John Gottman demonstrated in his couples' research in which he could predict couple's divorce with 90% accuracy, the way you approach your partner when resolving issues is key. Perhaps online dating sites should consider this in their algorithm? In reading “Focus on Mental Health Laws to Curb Violence Is Unfair, Some Say” in the New York Times I am aware that little attention has been paid to the fact Adam Lanza was suicidal. As the Director of a Counseling Center and the head of the NYC College Suicide Prevention Consortium I am persistently concerned that suicidal students who need inpatient psychiatric care cannot get it because there are so few hospital beds available for treatment. We certainly need more funding for mental health services to stem the homicides committed by mentally ill individuals with guns. But what of the data that there are many more, over 38,000, that kill themselves every year (at least half with guns)? Most of these individuals have been to a doctor within the past 30 days, just like Adam Lanza. Perhaps if there was a place for them to be treated far fewer would die. Some good news - "After shootings, states rethink mental health cuts"
Good news, the Associated Press has an article regarding states reconsidering the mental health cuts in their budget. To date most of the dialogue coming out of the Newtown shooting has been about gun control. Equal mention of providing sufficient services for those with mental health difficulties has been lacking. Let us hope for more articles! There is a good article in the NY Times about preventing divorce before marriage by examining one's choice. However what seems to be missing in the piece is the decision-making process around the desired "goals" of the marriage (i.e., what someone wants out of the relationship in the long term). A wonderful example is arranged marriages-they are often goal-oriented and have lower divorce rates.